Whether you’re lacking good soil to grow in or want to save space, you may have considered using an upside-down tomato planter. To grow tomatoes in an upside-down planter requires no extra supplies other than the planter. With the tomatoes suspended upside down, staking or caging them isn’t necessary and the chance of airborne disease is lower. Place your planter where the tomato plant will receive full sun and can be reached for watering and harvesting. Add 1 to 2 inches of peat moss to the bottom of the planter. Hang the upside-down planter where it will have 5 feet of clearance from the floor or ground. Slip a tomato seedling up into the planter from the bottom, leaving the body of the plant hanging out of the bottom. Firm the peat around the root ball of the plant to hold it suspended. Add potting soil to the rest of the planter to surround the roots, and fill the planter up to 4 inches from the top. Layer mulch over the potting soil 2 to 3 inches deep at the top of the planter to keep moisture in. Pour water slowly into the planter at the top. Feel the soil at the bottom to know when it becomes moist without pouring out. Make note of how much water is needed before it reaches the bottom. Water the soil regularly for the first month to keep the bottom soil of the planter moist. Water only once or twice a week after new growth has begun, giving more if needed over the summer months. Pinch off the tips of the tomato plant if and when it reaches the ground to stop it from getting taller. Pick ripe tomatoes when they are red and come off the vine easily. 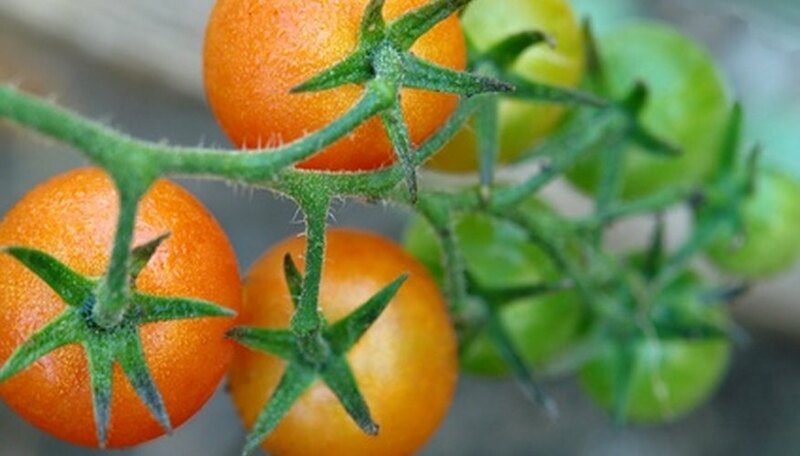 Fertilize the tomato plant with an all-purpose vegetable fertilizer if the potting soil doesn't have a feed in it. Stop feeding the tomato when fruits begin to form. Look weekly for signs of disease or insects on the leaves and stems and treat accordingly as soon as possible.